You can Special Summon this card (from your hand) by Tributing 1 "Performapal" monster, except a Pendulum Monster. 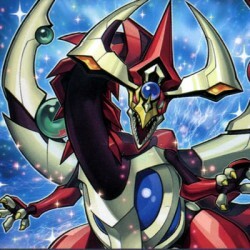 Once per turn: You can discard 1 card, then target 1 face-up card on the field; destr..
Pendulum Effect:- Once per turn, during the End Phase, if this card was activated this turn: You can destroy this card, and if you do, add 1 Level 7 or higher monster to your hand, that is either in ..
Pendulum Effect:- Once per turn, when a monster you control inflicts battle damage to your opponent: You can send the top card of your opponent's Deck to the Graveyard. Monster Effect:- This card ca..
Pendulum Effect :- Unless you have a card in your other Pendulum Zone, destroy this card. While this card is in the Pendulum Zone, any battle damage you take becomes halved. Monster Effect:- FLIP: Yo..
Pendulum Effect:- Once per turn, if you control a "Performapal", "Magician", or "Odd-Eyes" card in your other Pendulum Zone, except "Performapal Parrotrio": You can make this card's Pendulum Scale be.. If this card is Special Summoned: You can add 1 "Performapal" monster from your Deck to your hand, except a Pendulum Monster. You can only use this effect of "Performapal Longphone Bull" once per turn.. The first time this Special Summoned card would be destroyed by battle each turn, it is not destroyed. Once per turn, during your opponent's End Phase: You can target 1 Level 3 or lower "Performapal" ..
Pendulum Effect: You can reduce the battle damage you take from an attack involving a Pendulum Monster you control to 0. During your End Phase: You can destroy this card, and if you do, add 1 Pendulu..
Pendulum Effect: If a Pendulum Monster you control battles, your opponent cannot activate Spell Cards until the end of the Damage Step. Unless you have a "Magician" card or "Odd-Eyes" card in your ot..
Pendulum Effect: You must control no monsters to activate this card. If a Pendulum Monster you control battles, your opponent cannot activate Trap Cards until the end of the Damage Step. Unless you h..
Pendulum Effect: Once per turn, when an attack is declared involving a monster you control and an opponent's monster: You can target that monster you control; it gains 600 ATK until the end of the Ba.. When this card is Normal or Special Summoned: You can send 1 "Performapal" monster from your Deck to the Graveyard, except "Performapal Secondonkey". If you have 2 cards in your Pendulum Zones, you ca..
Pendulum Effect: During the End Phase, if this card was activated this turn: You can target 1 face-up Spell/Trap Card on the field; destroy it. Monster Effect: A mechanized life form, roving through..
Pendulum Effect: You can target 1 other Spell/Trap Card on the field; destroy both it and this card. You can only use this effect of "Archfiend Eccentrick" once per turn. Monster Effect: You can Tri.. When this card is destroyed by battle and sent to the Graveyard, or when this card you control is destroyed by an opponent's card effect and sent to your Graveyard: You can Special Summon 1 EARTH Pend..
Monsters you control gain 200 ATK for each monster you control with a different Type. Once per turn, if you control 4 "Performapal" monsters with different Types: You can Special Summon 1 "Odd-Eyes" m..
Special Summon 3 "Hippo Tokens" (Beast-Type/EARTH/Level 1/ATK 0/DEF 0), but they cannot be Tributed. You cannot Special Summon monsters from the Extra Deck while a "Hippo Token" is in a Monster Zone. ..